It is with no desire for controversy or of a lack of tender feelings toward my fellow-countrymen of Irish birth or their descendants of every religious persuasion that I write to you on the subject of some Hibernian fallacies. While St. Patrick’s Day has passed beyond the vulgar ridicule of former years, yet it still remains a day of questionable sincerity toward unqualified American citizenship. It is still observed in a too sectarian spirit and with hatred of Great Britain. I may remark, however, and I am not a Protestant Irishman, but a Russo-Greek Catholic, that nothing touched me more respectfully than to have seen a great United States flag hanging between the two spires of the Roman Catholic Cathedral on last St. Patrick’s Day. There was no other emblem there. That flag was an object lesson to Irishmen in the parade, viz., that the Stars and Stripes recognized no other authority or prejudice, either ecclesiastical or national, but those which could live in peace and toleration beneath its sway. That flag welcomed the sons of Irish birth and blood to the full and free use of Fifth Avenue. But, on the other hand, it frowned upon any man in the St. Patrick’s Day procession who dared to carry the Irish flag merely to dictate to our Government or disturb our neutrality. I am convinced that after this terrific European strife is over we shall be apt to see fewer foreign flags borne in processions. Hyphenism in nationality will be so abhorred in the United States that those who carry an emblem to proclaim it will meet with the same welcome (?) as those who bear the red flag of anarchy. St. Patrick was the great Celtic missionary to Ireland. In this broad and yet strictly orthodox Catholic way there is no sect, party, or, if the title “Church” is more desirable, which does not own St. Patrick and which ought not here in America and elsewhere honor his name and keep his natal day as one of the greatest sub-apostolic missionaries of Christian civilization. Every Irishman and every person benefited by what Irishmen have done to advance morals, Christianity, and good government in the world can and ought to celebrate. But if the keeping of the day as sacred means hyphenated nationality or anything un-American, then let the sons of Ireland remember that they have no place in the respect or love of this great Republic, and especially in these trying times for our Government. We want no flag but the Stars and Stripes. No “Irish-Americans,” but American citizens. St. Mary’s College, Brooklyn, N.Y., March 13, 1916. I should note that Irvine himself was from Ireland. He immigrated to America with his mother and siblings when he was a teenager. His comments should not be taken as anti-immigrant or nativist; indeed, he worked closely with immigrants from Syria and Russia. Irvine grew up Anglican, not Roman Catholic, so his position that no Church “owns” St. Patrick is understandable. That said, from his other writings, it is clear that he viewed the Orthodox Church as the Church, so he wasn’t espousing some sort of relativist ecclesiology. It’s interesting to note that Fr. 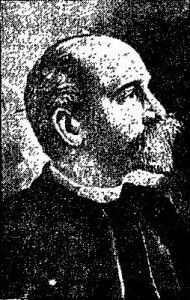 Patrick Mythen, who joined the Russian Archdiocese a few years later (in 1920), was a leading proponent of Irish independence from Great Britain. That is, Mythen (who at the time was an Episcopal priest) was one of those people Irvine decried as trying “to dictate to our Government or disturb our neutrality.” Both Irvine and Mythen were outspoken Irish Episcopalians who converted to Orthodoxy, but they were as different as night and day.